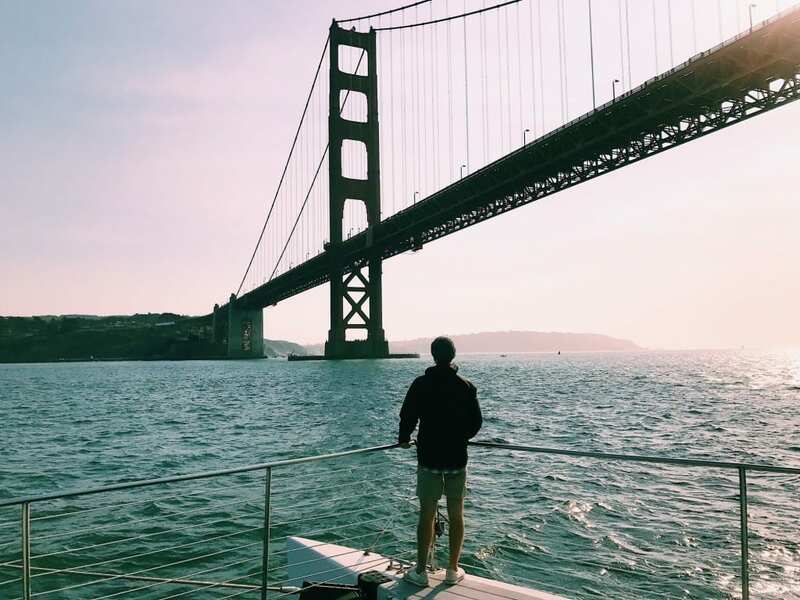 What do you do when you have a day to spend in San Francisco? You go sailing of course! 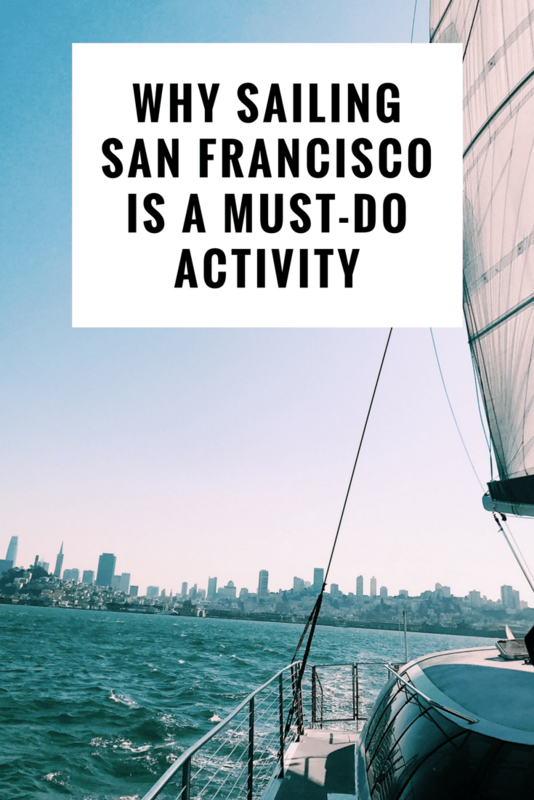 We went sailing San Francisco with Adventure Cat Sailing Charters and have deemed this a must do activity. We didn’t really have a solid plan for what to do while there, but it was still fun. But this time we had a plan. 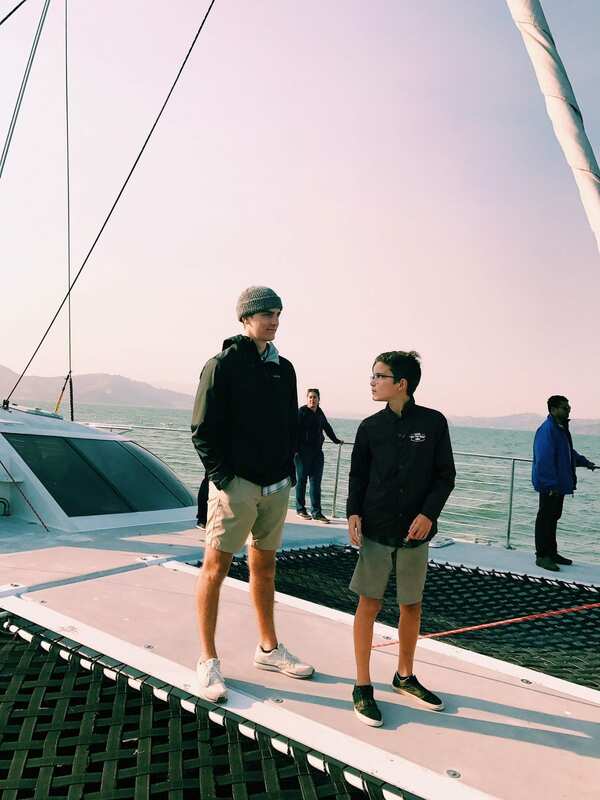 My boys and I were going sailing in San Francisco. I grew up riding on boats in the Texas lakes with my dad and grandpa and I also grew up going to the beach every summer. Needless to say, I have both a love for boats and a love for the water. But I’ve never been sailing. I always thought it looked like fun, but it wasn’t something I felt this strong need to do. 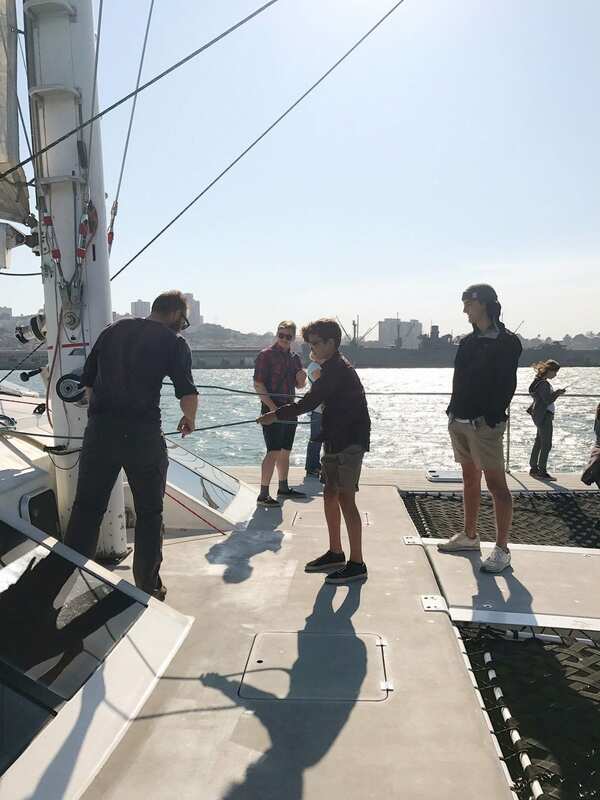 To book a trip with Adventure Cat Sailing, you can either call or book online. We scheduled our sailing trip for 3 pm. so we would have most of the daytime to explore the city. They also have trips available at 1 pm and sunset, but be sure to call for the sunset times. For a 90 minute, blow your socks off (seriously, it was windy), ride around the bay it’s $45 for adults, $25 for kids 6-12 and free for kids five and under. Their dock is very easy to find and they send you an email with detailed directions of how to get there and where it is. 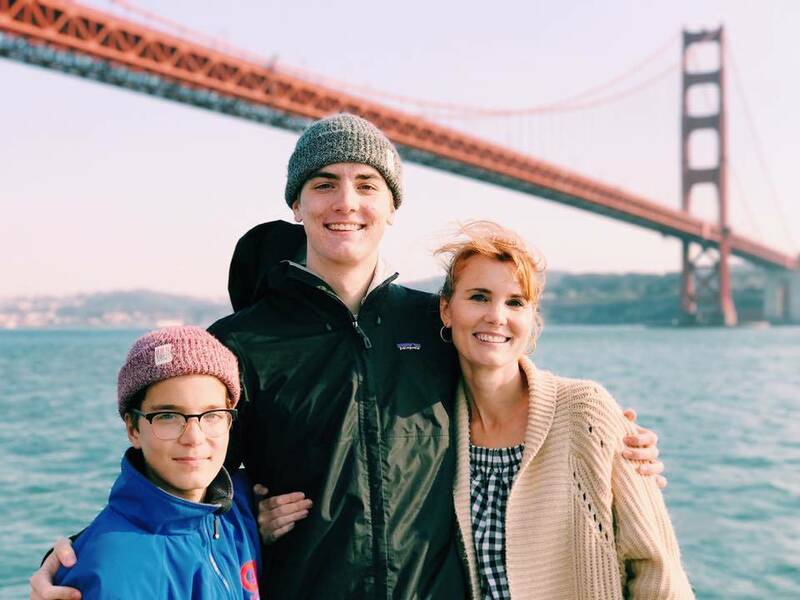 If you’re familiar with Pier 39, it’s close to the sea lions at Dock J. There’s a sign on the dock telling you that you’re in the right place and when they’ll open the doors to board. Our trip started by being greeted at the dock by one of the captains, who has a great beard. (Spoiler alert: they all have great beards.) You give them your name and they make sure you’re on the list and then you board the boat. After the safety briefing, we were off! The boat has several areas for you to sit and enjoy the trip, according to your preference. Do you want to see the sights but be out of the wind? Then you can sit in the cabin area at the tables. Bonus: it’s by the bar. Do you want to have the wind in your hair just a little bit and not get wet? Then you can sit on a small bench just outside the cabin. 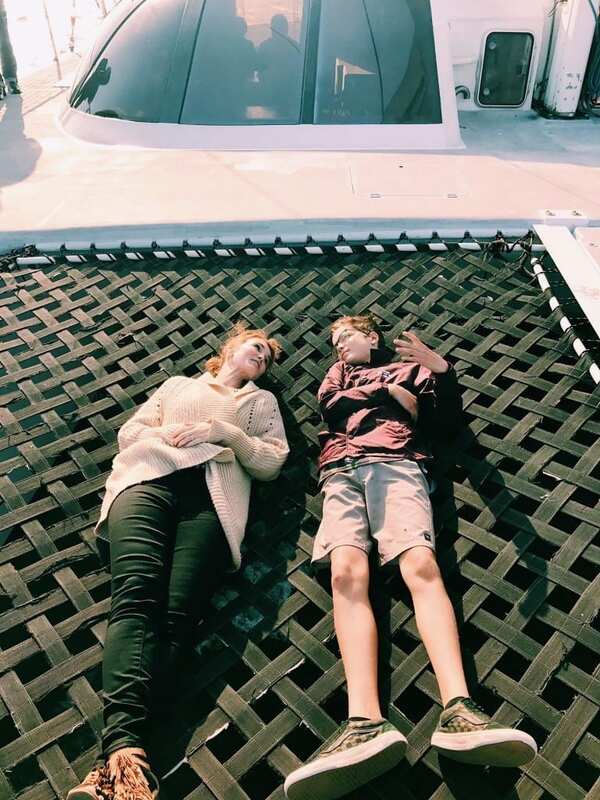 We spent 95% of our time on the main deck and enjoyed every minute of it. I had no worries about getting wet or what the wind did to my hair. I mean obviously because look at this picture. 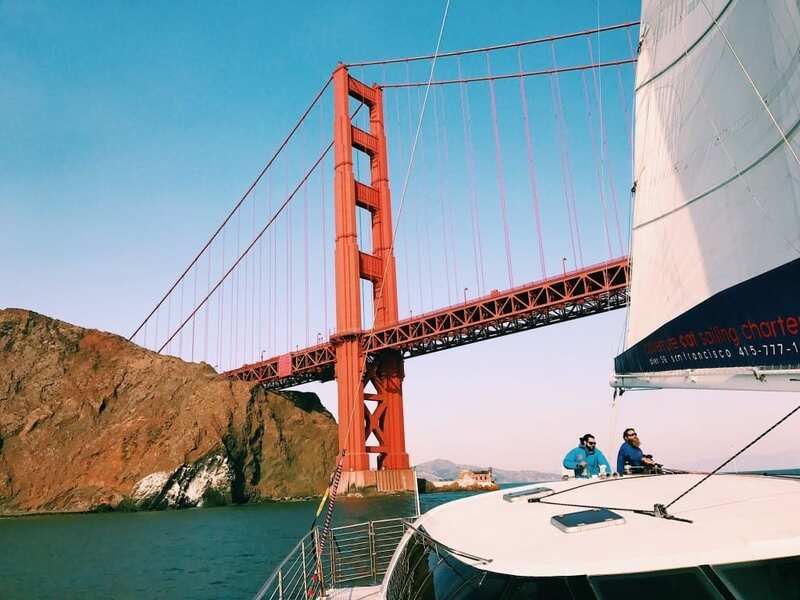 We sailed around Alcatraz Island, Fort Point and then under, yes under the Gold Gate Bridge. 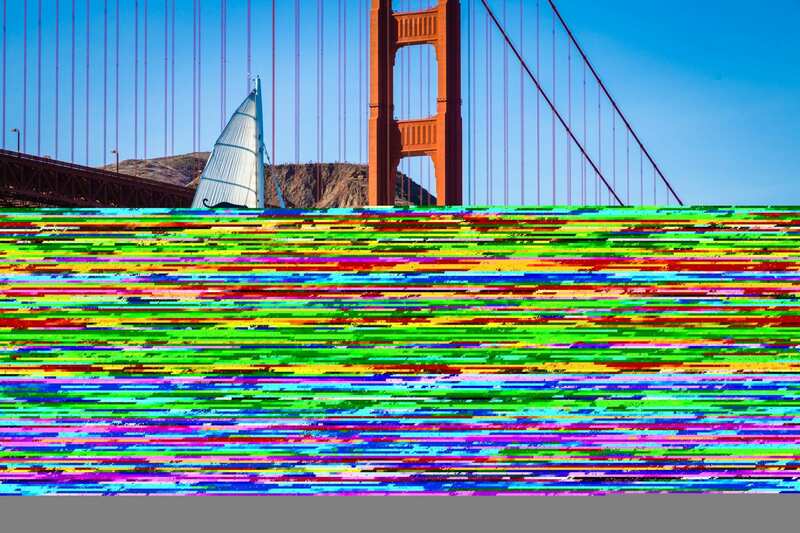 People, this is I believe, the best way to experience the Golden Gate Bridge. I’ve walked on it. I’ve driven over it in a car. I’ve driven over it on the top deck of a double-decker bus. But none of those compare to sailing so close to it and then under it. The crew stopped the boat right in front of the bridge so everyone could have some amazing pictures taken and soak it all in. It was a fun and fascinating experience, to say the least. I wore jeans, a lightweight shirt, sandals and a heavy cardigan and was very comfortable. 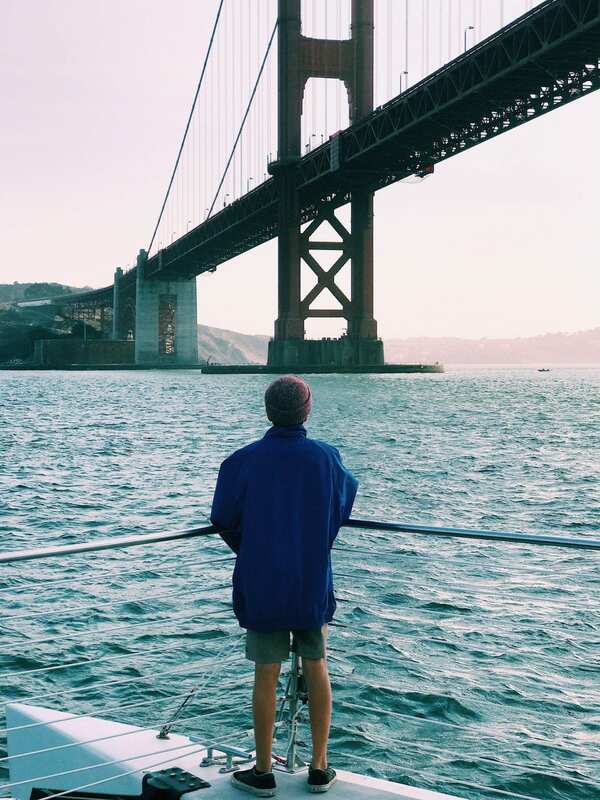 It does get a little chilly out there on the water, but they do have jackets available if you need one. They recommend wearing sneakers or other soft-soled shoes, but if you want to dress up for a special occasion – go for it! Yes, but for the daytime sails, you have to purchase them yourself. 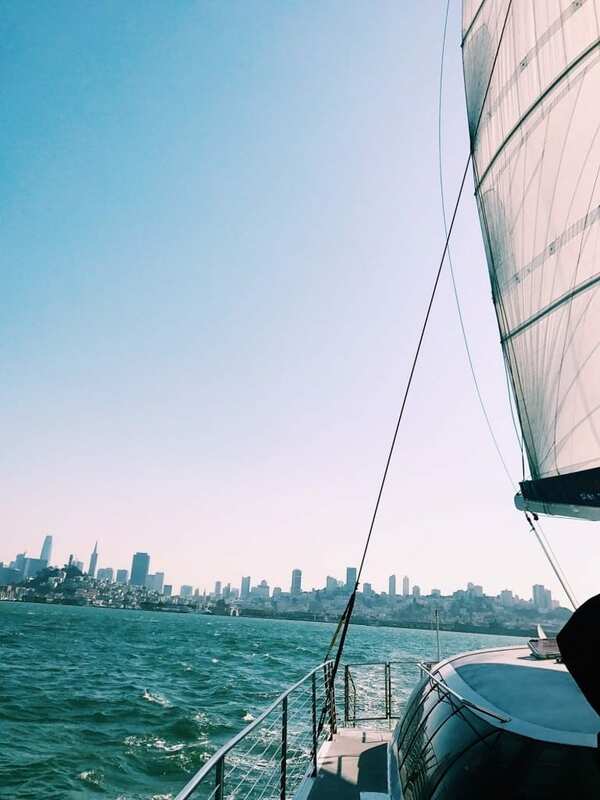 The sunset sail includes hors d’oeurves and two complimentary drinks. 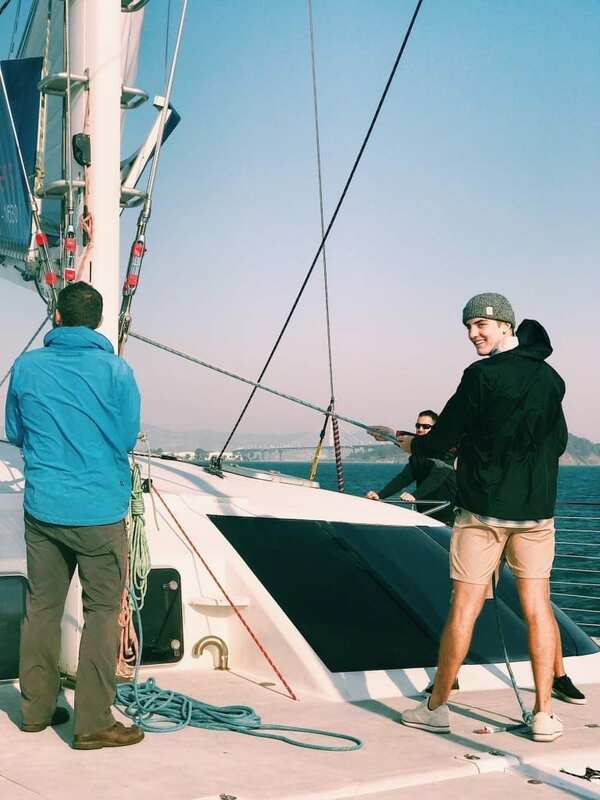 What makes Adventure Cat Sailing unique? One of the crew members has been with the company over 14 years. He started out cleaning bird poop off the deck. Have you ever been to San Francisco? 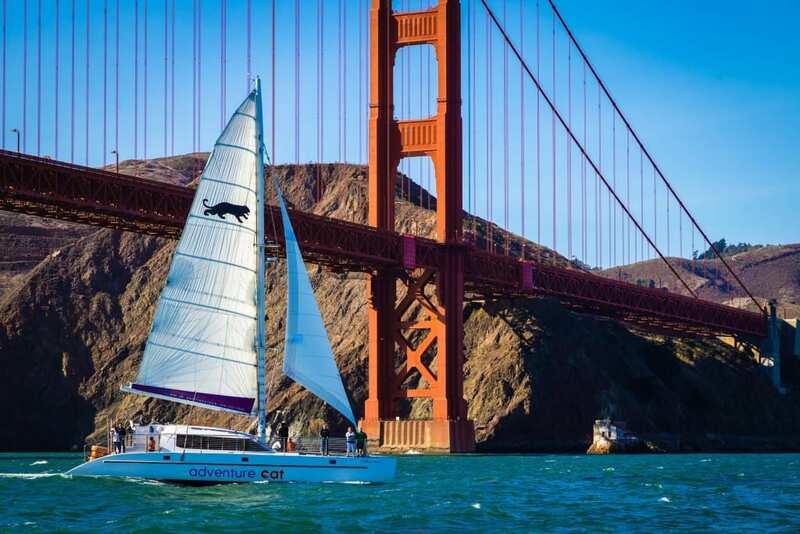 Add sailing with Adventure Cat Sailing to your must-do list if you’re planning a trip there. It’s the perfect activity for the entire family or just you and your special someone. I have done this sail over 20 times, I’d do it every day if I could. LOVE it. Love the crew. Love the views. 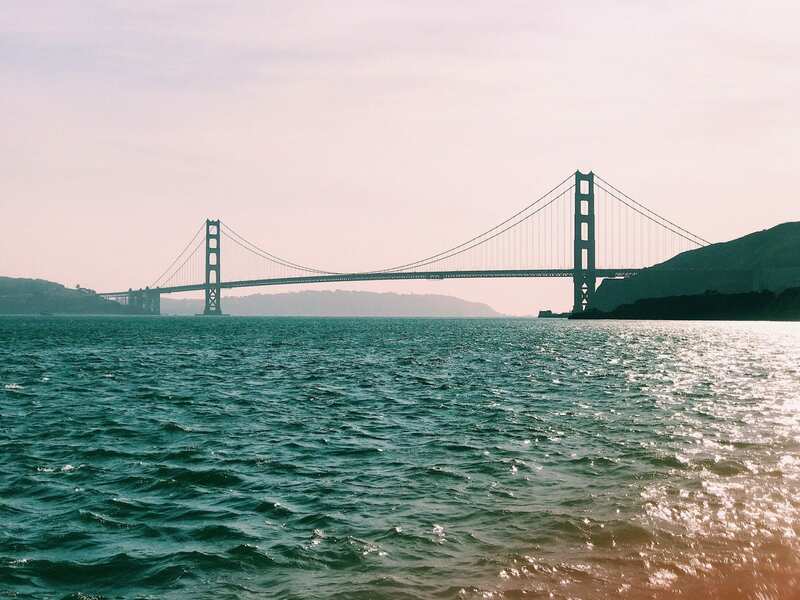 I take all my out of town guests, there’s no better way to experience SF, we ARE the City on the Bay! I agree there’s no better way! I can’t wait to go again. Taking out of town guests on this is a brilliant idea.